The Blog of the Hobbit: An Early Revelation of Smaug? An Early Revelation of Smaug? 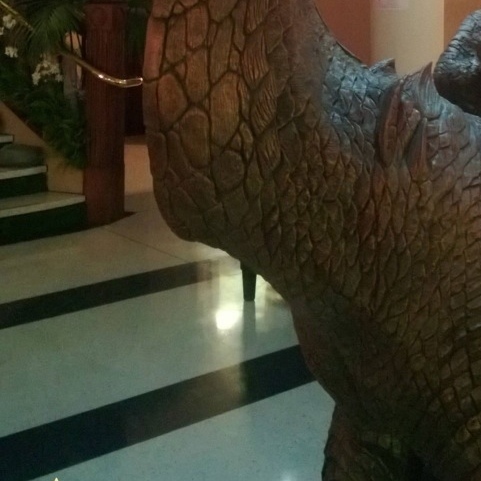 Could this possibly be a statue of Smaug? I personally think that this is nothing more than a false alarm, but there is no way I would pass this up, not matter unlikely it is. 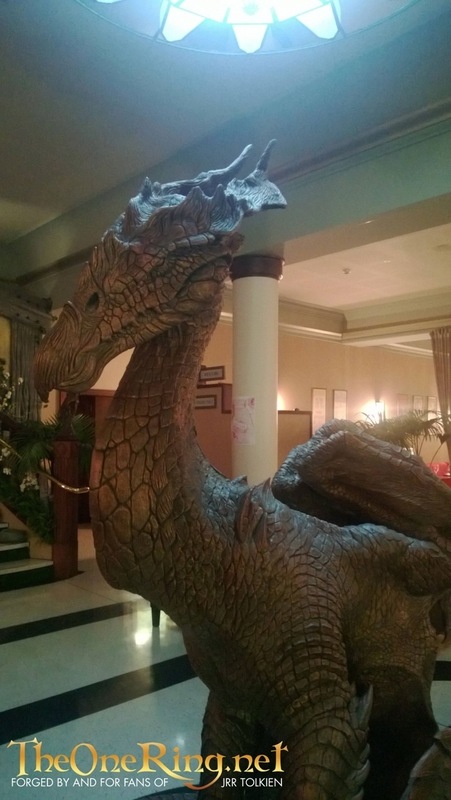 TheOneRing.net received a photo that may be a statue of Smaug set up in the foyer of the Roxy Cinema in Miramar, Wellington. It is not labeled, but it is in a spot that has hosted statues of past PJ films. MAJOR SPOILERS! You can compare it yourself with the only other illuminating picture of Smaug we have: his eye. All in all, I seriously doubt that this is a statue of Smaug, or, at least, what he will actually look like. My reasons are: first, the coloring is different, though must be admitted that in the pictures below the Smaug is in a dark room. Second, the brow-ridges are different. Above, it is just a protruding row of smooth scales. Below, the scales are pointed into a row of spikes. At least one of the pictures has a few incorrect details, and I highly doubt that it is the one shown in the movie.